Zushi Beach (逗子海岸) is located west side of Miura Peninsula. 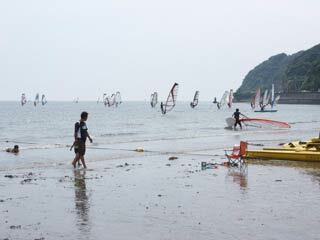 Because it has a strong wind and less waves, it is very popular wind-surfing spot around Tokyo. Also, it is one of the popular beach near by Tokyo and Yokosuka. During summer, there are many food stands open on the beach. 1. use JR Yokosuka Line to Zushi. It is 850m wide beach. In summer, there are fireworks in this beach.